This game title uses the Frostbite 3 game engine and looks great. 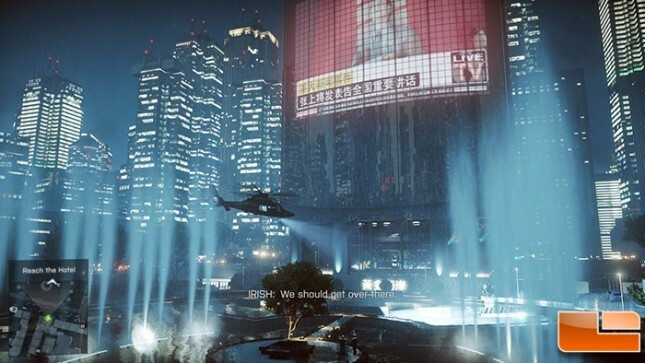 We tested Battlefield 4 with the Ultra graphics quality preset as most discrete desktop graphics cards can easily play with this IQ setting at 1080P and we still want to be able to push the higher-end cards down the road. 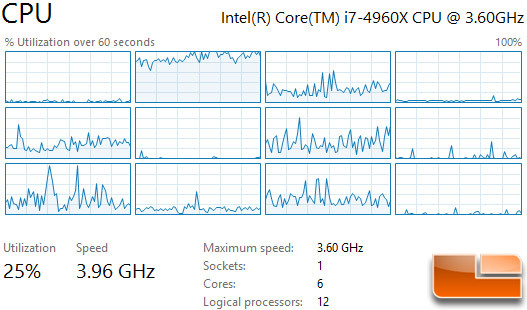 We used FRAPS to benchmark each card with these settings on the Shanghai level. 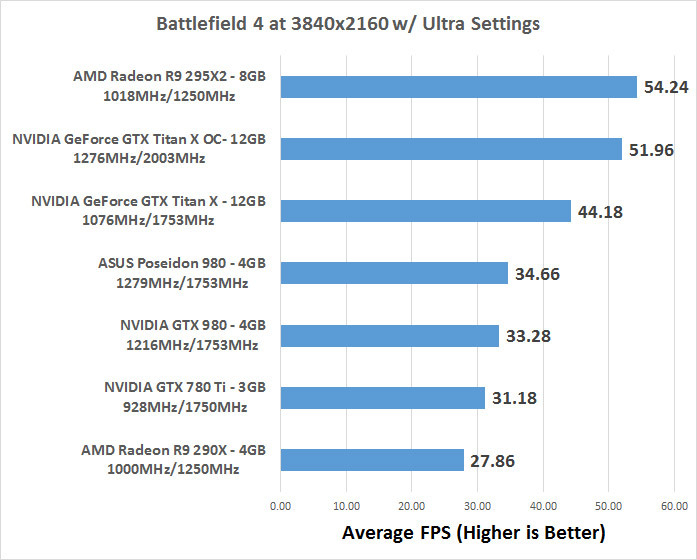 Benchmark Results: In Battlefield 4 with Ultra settings at 3840×2160 we were able to average 33.28 FPS on the GeForce GTX 980 reference card versus 44.18 FPS on the GeForce GTX Titan X. 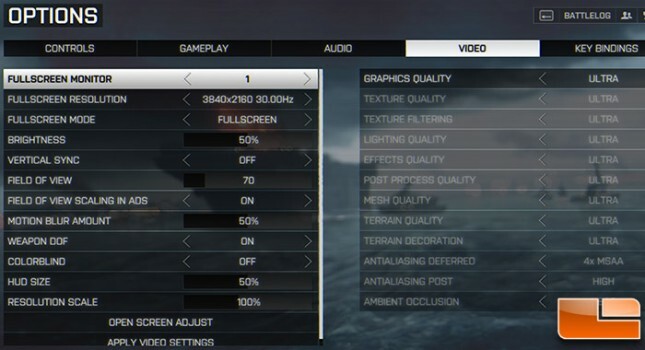 The AMD Radeon R9 295X2 averaged 54.24 FPS, so it is about 10 FPS faster on average in BF4 with these settings. By overclocking the NVIDIA GeForce GTX Titan X we were able to improve the average performance up to 52 FPS, but that is still slower than a stock Radeon R9 295X2. Benchmark Results: The GeForce GTX Titan X ran BF4 pretty smoothly with these settings and and we seldom dropped below 40 FPS at 3840×2160. 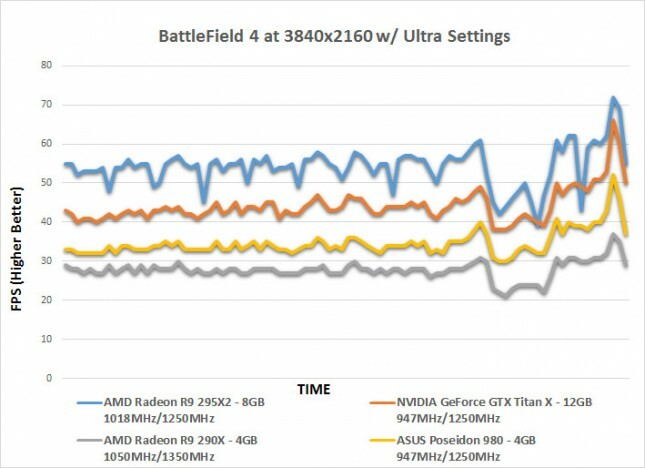 The AMD Radeon R9 295X2 runs AMD CrossFire, and you can see this when looking at performance charted over time as the frame rate was a bit more sporadic as you can see from the chart above.